The pink to purple flowers of the Rosie Posie Agastache will add depth to your butterfly garden. 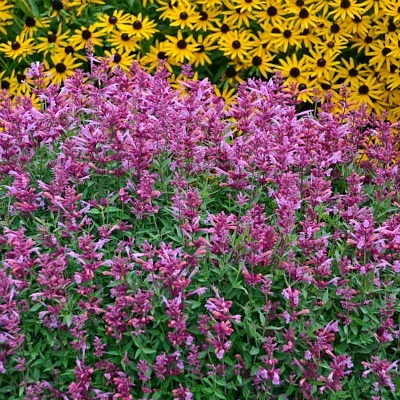 Pair with Kudos Yellow Agastache for great color contrasts. The compact growth makes it easy to place among other plants to compliment colors. Mix with other agastache varieties to attract a variety of butterflies, hummingbirds and bees. Rosie Posie Agastache is grown in a 3.5 inch pot. Orders shipping to CA or AZ may be bare rooted and root washed before being prepped for shipping.